It was late morning, and the sun still hung low enough in the sky to cast a warm hue over the rapeseed fields, the high-frequency light washing over the blanket of golden blossoms beneath the deep blue sky, intensifying the landscape like turning up the saturation on a high-def television set. Just beyond, its weathered basalt cliffs shining in the light, Sanbangsan Mountain stared down upon the fields like a giant sentinel, an old soldier battered, bruised but not beaten by millenia of battle against the elements. On any other day, there should have been crowds of tourists milling through the fields like ants through an ant farm, smartphones and tripods at the ready, all searching for the perfect angle to get the perfect selfie. This morning, however, there wasn’t a soul there — not for the first five minutes, at least — lending an extra layer of surreal tranquility to a majestic setting. Jeju is a land of much scenic splendor, and the southwest quadrant of the island is no exception to this, blessed as it is with beautiful seashores, lovely islands, dense forests, picturesque fields of flowers and barley, sprawling tea plantations and brilliant sunsets. What it lacks, relatively speaking anyway, is tourists. 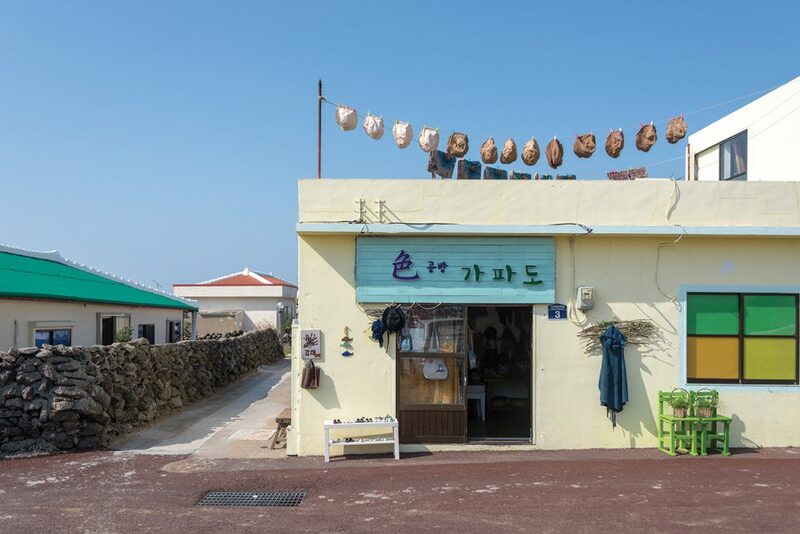 Compared to better-tread parts of the island, southwest Jeju is quiet, rustic, less gentrified. 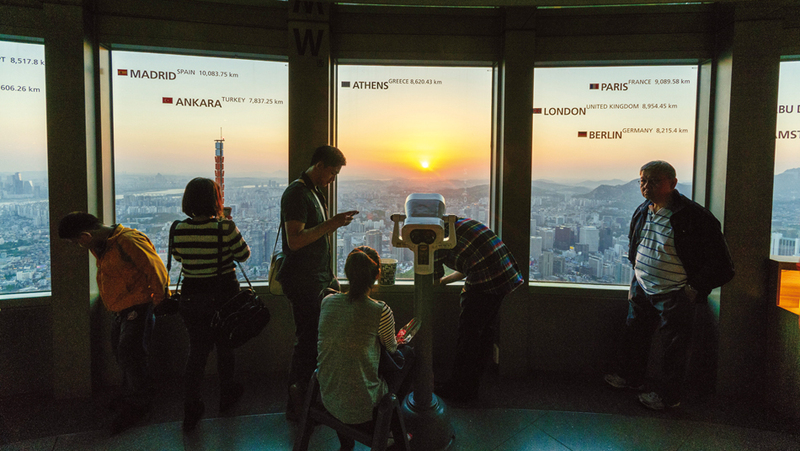 That’s not to say it’s empty — no place in Jeju is, and on a weekend, scenic spots sport the usual crowds of sightseers, hikers and photographers. What you won’t find, however, is the commercial hyper-development seen elsewhere. Hallasan Mountain looming in the distance, hikers stroll along Songaksan Mountain. For our purposes, southwest Jeju can be defined as stretching from the Yongmeori and Sagye coasts in the east to the volcanic tuft cone of Suwolbong Peak in the west. It’s a volcanic landscape shaped by the wind, water and, most importantly, the fire in the belly of Hallasan Mountain, the nearly 2,000-meter-high shield volcano that birthed the island itself. 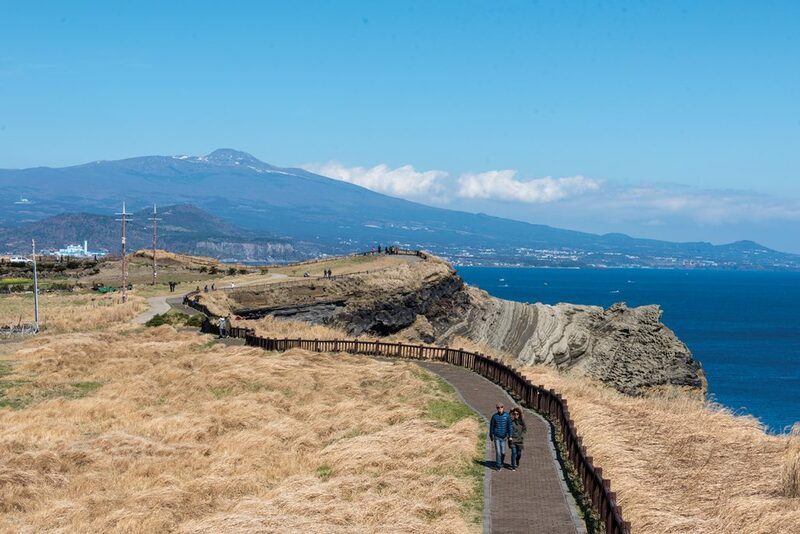 The Jeju Olle Trail (www.jejuolle.org), the island’s renowned network of coastal footpaths, connects most of the region’s scenic spots, namely along routes 10, 10-1, 11 and 12. The most important population center is the fishing port of Moseulpo, where you’ll find the biggest selection of restaurants and accommodation, not to mention the ferries to the islands of Gapado and Marado. The Yongmeori and Sagye coasts are volcanic seashores dominated by the awesome mass of Sanbangsan Mountain, the bell-shaped lava dome that defines the landscape of this part of Jeju. Likened by one enthusiastic Jeju Tourism Organization blogger to Arizona’s Grand Canyon, the Yongmeori Coast is a breathtaking system of lava cliffs that jut into the ocean like a dragon’s head — hence the name, which translates as “Dragon’s Head.” While certainly worth exploring, weather conditions may keep you off the rocks. Much more accessible is the Sagye Coast, a long seashore stretching from the small town of Sagye in the east to Songaksan Mountain, a popular hiking destination, in the west. Here, the seashore alternates between sand and black volcanic rock. It’s especially beautiful at sunrise, when mist swathes Sanbangsan and Hallasan and the new sun bathes all in shades of red and violet. Flanked by blooming flowers, charming cafés and plenty of spectacular seaside views, the Sagye Coastal Road draws plenty of bicyclists and windshield tourists. 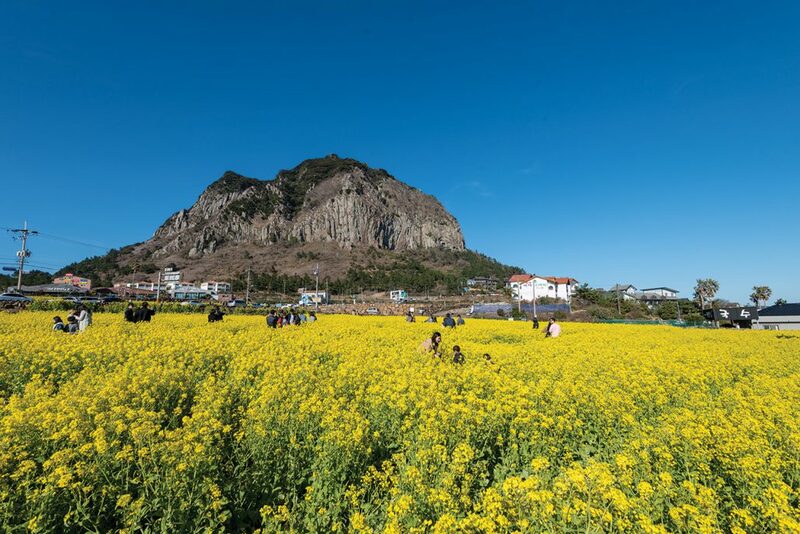 In spring, fields of golden rapeseed blossoms blanket the lower slopes of Sanbangsan Mountain, especially around the town of Sagye. Hordes of photographers, young couples and families descend on the fields at this time, and for good reason — they’re stunningly beautiful. Pro tip: if you arrive early, you’ll not only avoid the crowds, but the warmer light will yield better photographs, too. 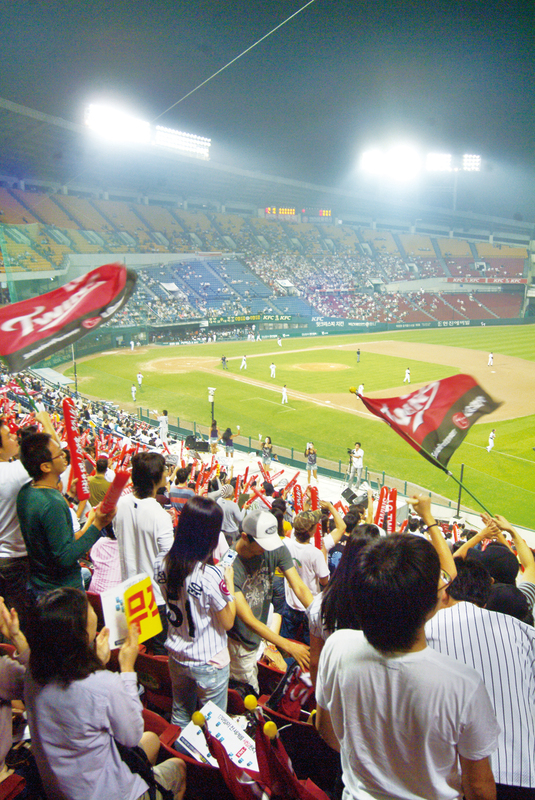 Bring some small bills with you, though, as the fields are private property and owners typically charge you KRW 1,000 to enter. 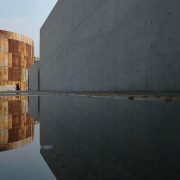 Concrete hangers of Altteureu Airfield testify to Jeju’s tragic past. At the west of the Sagye Coastal Road is Songaksan Mountain, a low volcanic cone on a small, windswept peninsula that thrusts into the sea. Surrounded by grassy fields and volcanic coastal cliffs and boasting inspiring views of Sanbangsan Mountain, Hallasan Mountain and the nearby islands of Gapado and Marado, the cone attracts great crowds of hikers on the weekend. Indeed, the peak is the centerpiece of Route 10 of the Jeju Olle Trail. Also on the peak and in the cliffs below you’ll find old bunkers and artillery placements, built by Imperial Japan during their 35-year occupation of Korea. Korea’s Japanese colonizers militarized Jeju, especially towards the end of World War II, when they fortified the island to stop an anticipated onslaught by Allied forces on the Japanese home islands. No less than 69,000 Japanese troops were stationed on Jeju on Aug. 15, 1945, the day Tokyo surrendered. This at a time when there were just 200,000 people on the island. A poignant reminder of this history is Altteureu Airfield, a former Japanese naval air station near Songaksan Mountain. 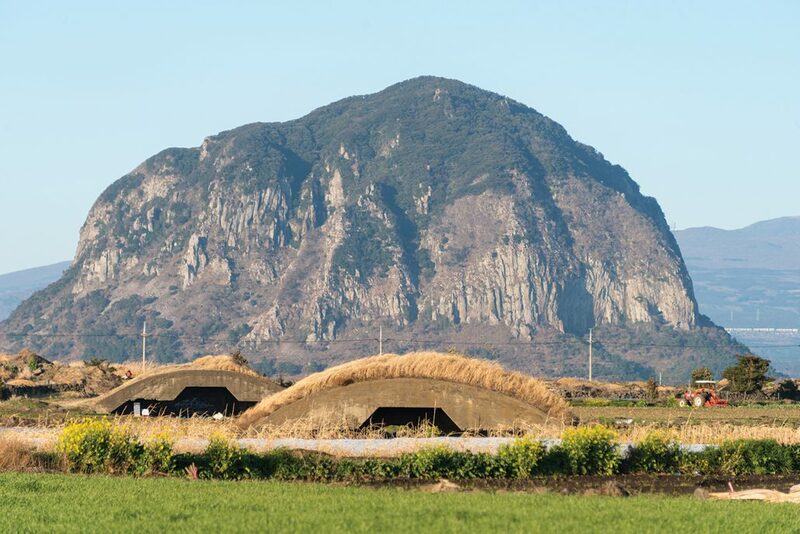 Though lettuce and potato fields have largely reclaimed the airfield, some facilities remain, most notably about 20 concrete hangers that incongruously dot the pastoral landscape like Enver Hoxha’s bunkers in Albania. Some of the hangers now contain works of art, a legacy of the Jeju Biennale 2017 arts festival. Gapado’s barley fields make for a picturesque walk. From the port of Unjin (a short walk from Moseulpo), ferries depart for Gapado and Marado, two nearby islands that are sometimes overlooked despite their abundant charm. Just 20 minutes away by ferry, Gapado is a small island covered in beautiful green fields of barley. In spring, when the barley grows high, it can seem the entire island sways with the sea winds. 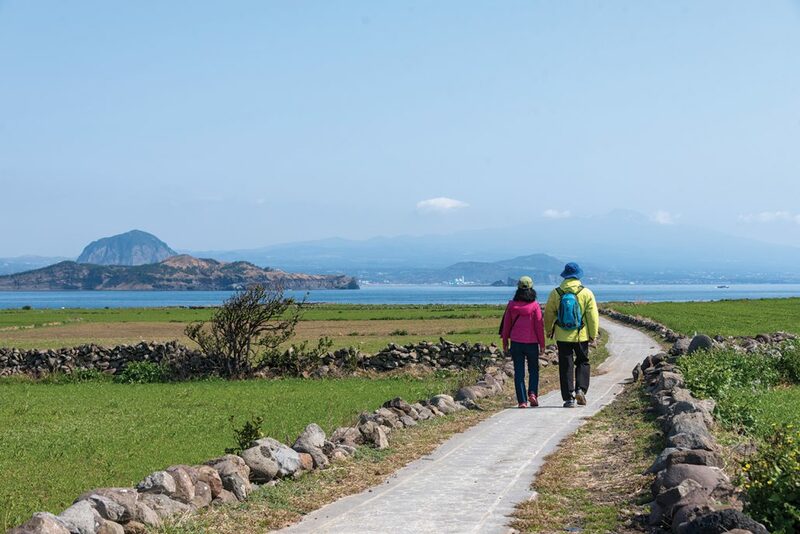 A branch of the Jeju Olle Trail, Route 10-1, crisscrosses the island, taking you along stone wall-lined paths through the barley fields. So beautiful the scenery is that the island hosts the Gapado Barley Festival every spring. This year it is set for April 10–May 10. It takes about two hours to circuit the island, even at a leisurely pace. Some 40 minutes from the mainland by boat is Marado, a tiny island whose main claim to fame is being Korea’s southernmost piece of real estate. The island, home to about 50 people, boasts a couple of landmarks, most notably a tiny Catholic church whose design brings to mind the abalone, conch and other products offered by the surrounding seas. Oddly enough, the island has also become famous for its Chinese black bean noodles, or jjajangmyeon, served with seafood. 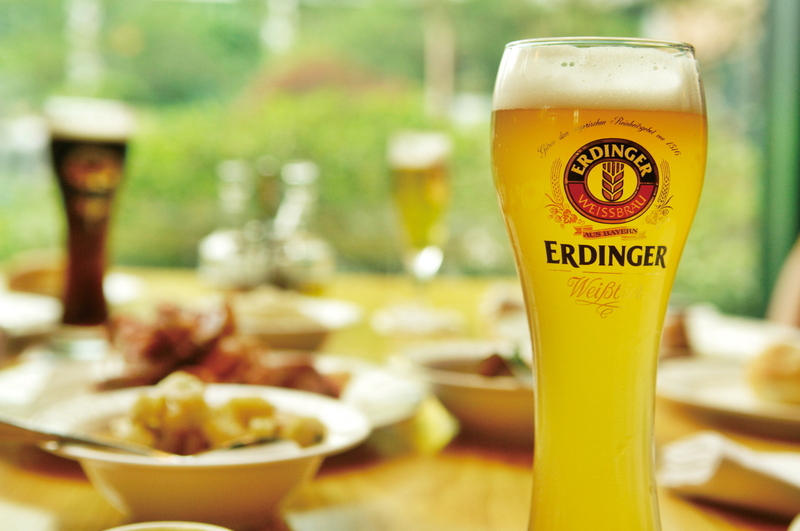 You’ll find about 10 restaurants serving it, all warring with one another to win customers. A shop on Gapado offers crafts made with natural dyes. Suwolbong is a 77-meter peak surrounded by volcanic cliffs formed 18,000 years ago by a pyroclastic surge, a fluidized mass of gas and rock ejected during a volcanic eruption. The beautifully layered coastal cliffs are almost singularly well-preserved, making them of intense interest to volcanologists. To the general public, the cliffs provide a spectacular backdrop to coastal walks, especially at sunset, when the descending orb turns the sea crimson red. From Suwolbong, you can follow the cliffs all the way to Chagwi, a small fishing port that is also a wonderful spot to gaze upon the nearby Chagwido Islands. Jeju’s largest uninhabited islands, the islands are beloved by landscape photographers and local fishermen, albeit for different reasons. The tiny but charming Cafe Saudade offers not only lovely views of the islands, but fine lattes as well. The day begins at Osulloc’s Seogwang-ri tea plantation. 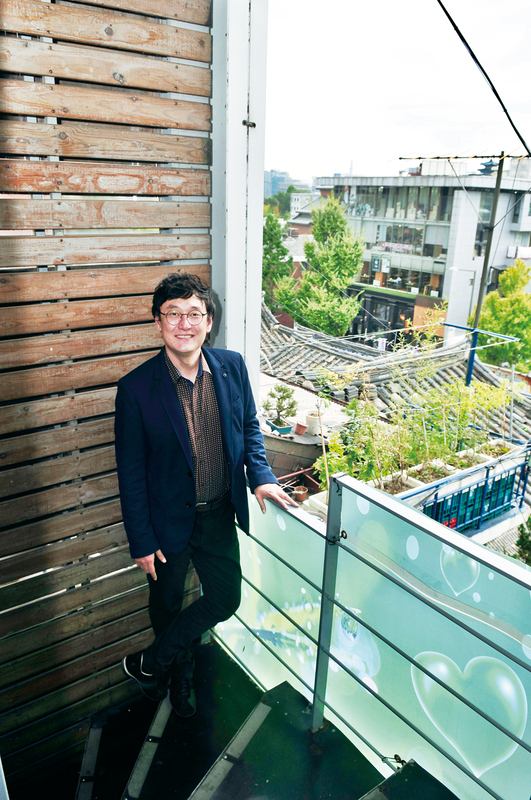 If you’re willing to go inland, green tea giant Osulloc operates a plantation at Seogwang-ri, a town on the lower slopes of Hallasan Mountain and on the road linking Moseulpo and Jeju City. 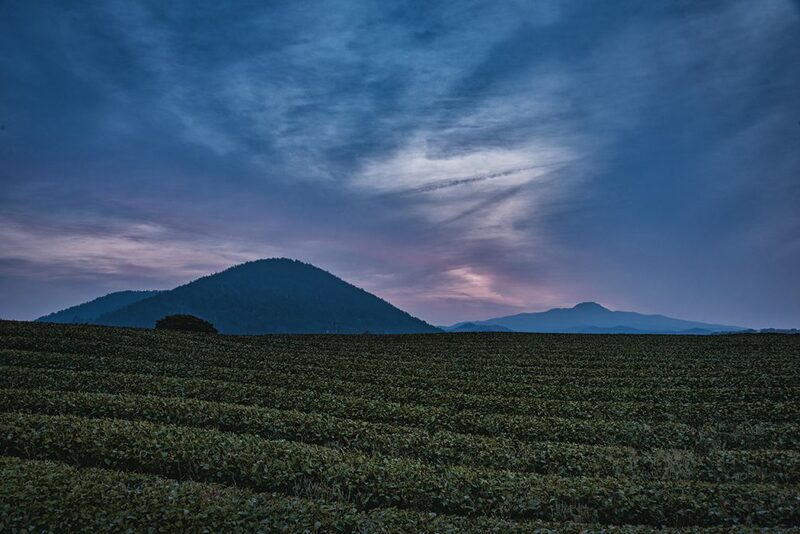 Unlike the terraced fields of Boseong, Jeju’s green tea fields are mostly flat, but they are no less beautiful, boasting as their backdrop Jeju’s famous parasitic volcanic cones, or oreum, and the massive pyramid of Hallasan Mountain itself. Next to the plantation is the Osulloc Tea Museum (www.osulloc.com), a strikingly designed cultural space with galleries, a tea shop and, of course, a café where you can enjoy green tea and green tea ice cream. 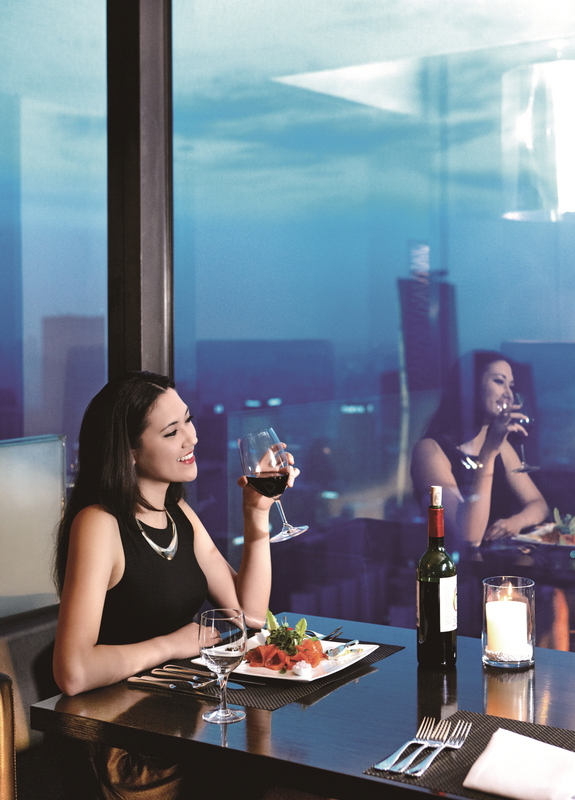 If you can, make a reservation for the Tea Stone, a stunning glass tea house where classes on the tea ceremony are given. Not far from Osulloc is Gotjawal Provincial Park. Gotjawal is a local term for the thick, mossy forests that grow on the volcanic bedrock of Hallasan Mountain’s middle slopes. Though similar forests can be found elsewhere on the volcano, this section is one of the most accessible. An observatory deck deep in the park gives you a view of the forest and surrounding landscape. 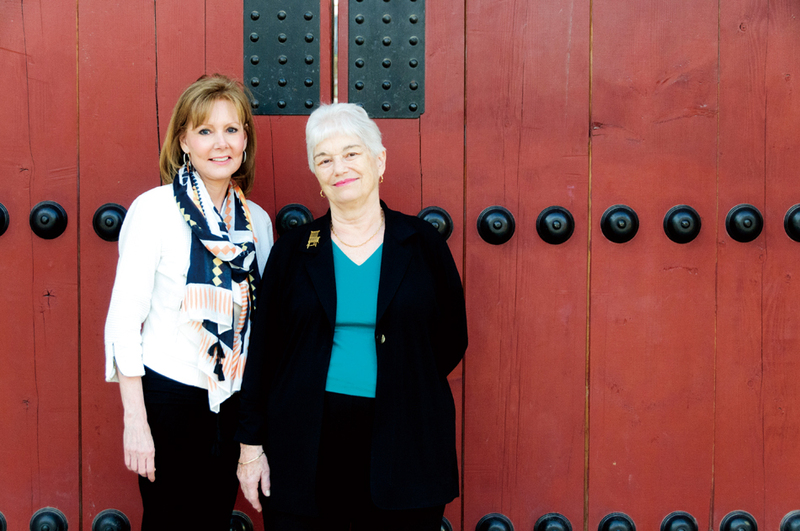 Moseulpo has a handful of reasonably priced hotels, and you’ll find the usual assortment of guest houses and pensions everywhere along the coast. Moseulpo is known for its seafood, especially yellowtail, or bangeo, and hairtail, or galchi. Moseulpo has a bit of the hip, too. Gla Gla Hawaii (T. 064-792-2737) does fish and chips and seafood boils. 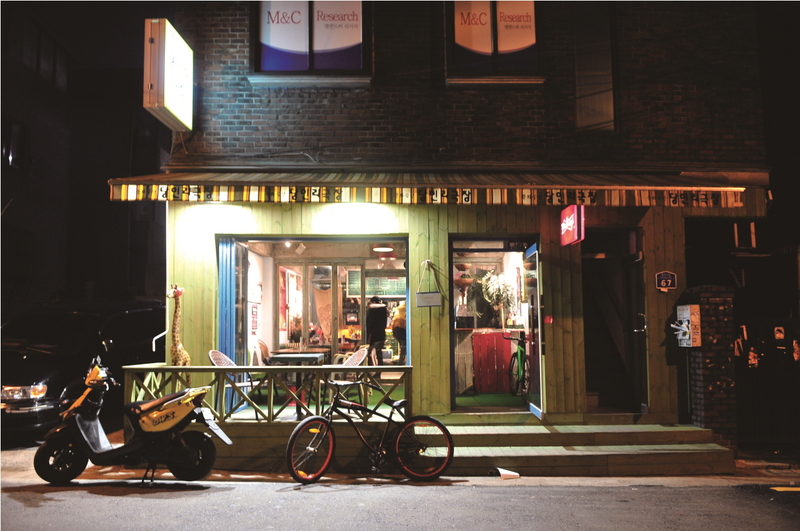 Just next door is Mendorong (T. 064-792-3727), a café that offers lovely handmade desserts, including apple pie à la mode. 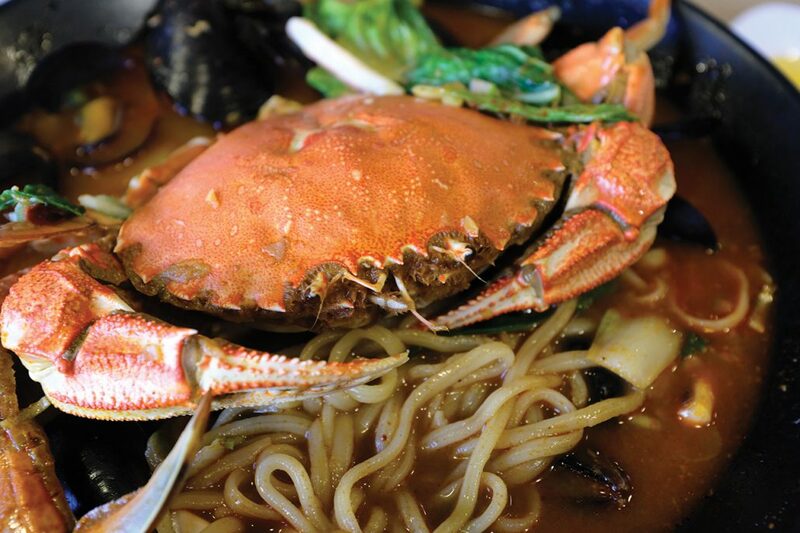 The trendy Chinese joint Hong Sung Bang (T. 064-794-9555) does a seafood jjamppong served with an entire crab. Flights to Jeju depart Seoul’s Gimpo Airport. Buses to Moseulpo depart Jeju Intercity Bus Terminal (travel time: about 1 hour, 30 minutes).